Water From Your Eyes doesn’t write sad songs, but its music might make listeners tear up. The winkingly-titled Brooklyn duo of Rachel Brown and Nate Amos has spent the last year or so churning out dance-infused post-punk so gleefully ecstatic that crying and dancing along feels natural, if not necessary. All a Dance, the band’s sophomore LP following an album and two EPs released in 2017, seems intent on destroying the line between post-punk and dance music with a smirk and a wink. Its six songs, which span 37 minutes, relegate Brown’s voice to almost a twee-like mumble, rendering it welcoming and even a bit coy against Amos’ bouncing but sparse confections. The songs sound more like soft revelations and dusty sunrises than they do defeated isolation and chilly moons, making for an album bound to please leather-wearing crust-punks just as strongly as it’ll satisfy the young city kids looking to get sweaty at a hip Friday night event. 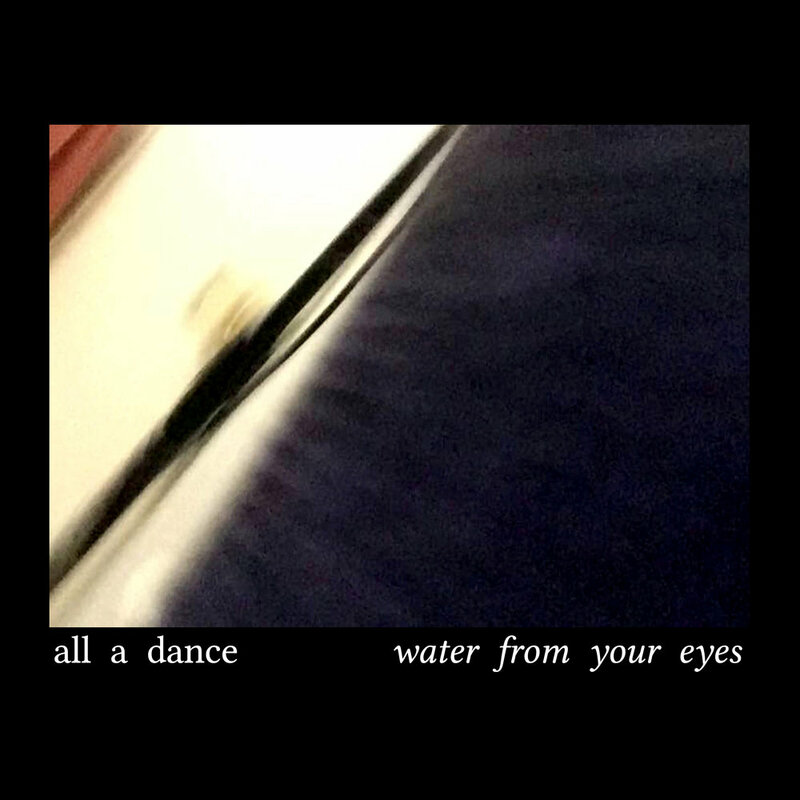 All a Dance is Water From Your Eyes’ first release on the revered DIY garage rock label Exploding in Sound. Some might thus expect a rock experience, and sure, they’ll get it, but the sounds really exploding out of this record are dance, euphoria, completely freeform bodily movement. The title track, which may be the closest thing that All a Dance has to a full-on banger, blooms from a lucid, intriguing guitar line that sounds like it’s tripping over itself into a frantic mesh of slapping percussion, sweeping and drawn-out synths, fresh-off-the-pan guitar noise, and Brown’s featherlight vocals. Miraculously, it never once loses the listener’s attention over the span of its vast seven-and-a-half minutes. “That’s the Girl” runs just one minute fewer and is only slightly less engaging for it, a softer palette of synth, hollowed-out percussion, and whispering guitar notes jovially guiding Brown’s languidly sung tale. “Saw Them Lie” and “Out of Town,” the album’s final two tracks, are just as compelling with runtimes a bit closer to the standard; both are more subtle bodyworks that diminish Amos’ arrangements and productions, giving more room to Brown’s voice and words. They hint at their melancholy following the four previous songs’ successes in cloaking them; it’s tough to miss their need for space, for just some time to think, even as the latter track arcs towards a modest crescendo to close out the album. Lyrics like “let me be in my head/let me smoke my cigarettes/let me take care of it/let me do what I do best” cast Brown’s headspace more transparently than anything that precedes them, mostly because Amos’ mixing blends their voice so deeply with the music that lyrics often become secondhand. “We’re Set Up” is so danceable that it effectively dulls the blow of the refrain “by your side but everyone has their secrets in this house/what is the truth? telling the truth is only someone’s lie”; its words are no less damaging than on either of the final two tracks, but across six minutes of faintly brooding but somehow invigorating sixteenth-note percussion and kraut-like, low-pitch guitars, they become glorious and numbing instead of hefty. Even on album opener “Let It Ring,” a statement like “trust no one and trust nothing/I don’t even trust in me” is so steeped in Amos’ thinly jubilant post-punk and dance vision that it impacts with barely a sting. And that’s precisely the point. All a Dance is a safe space for Brown to unload, Amos to experiment, and listeners to tune in and turn up. When Amos pumps out his densest works, Brown can safely vent to themself and anyone willing to transfix on the lyrics rather than the more instant element, the undeniable grooves. When he pulls back for moments that are more indebted to post-punk than to dance, Brown’s words hit similarly to how intimately the murmured-in-your-ear wishes of Frankie Cosmos or Jay Som do. Each mode tends ever so slightly stronger to either the post-punk or the dance crowd, but the album’s most striking achievement is how well it caters to both worlds at all moments. All a Dance makes excellent listening for anyone looking for the next exciting thing in any offbeat yet digestible rock or electronic subgenre. The reward may not always be a sob session, but only the truly closed-off won’t feel a surge of the most sought-after emotions.